The concert features Takamina’s last performances in Yokohama Stadium, starting with Maeda Atsuko’s appearance for a duet of “Omoi de no Hotondo”. Fellow ex-AKB48 graduates Oshima Yuko, Itano Tomomi, Shinoda Mariko also make their appearances, making it the grandest send-off for Takamina. A total of 31 songs featuring Takamina as center were performed. The DVD titled Shuku Takahashi Minami Sotsugyo “148.5cm no Mita Yume” in Yokohama Stadium will be released on 20th July 2016. Kojima Haruna planning to graduate at the same time as Takamina? Tokyo Sports claims to have gotten insider info that AKB48 1st generation member Kojima Haruna is planning her graduation to coincide with Takahashi Minami’s concert in March 2016. Tokyo Sports has time and again speculated on her graduation date, and whilst Kojima has always avoided realising Tokyo Sports’ speculations, it seems like she’s finally come to a decision. However, with the recent “passing of baton” going on with the younger generations, she changed her mind and seems ready now. Insider predicts that she will make the announcement to graduate with Takamina during AKB48’s annual Request Hour event in January 2016, and she’ll use the first day of Takamina’s concert (26th March 2016) for her own graduation concert. It seems like management is also reviewing the possibilities of AKB48 43rd single(which features former members Maeda Atsuko, Oshima Yuko, Shinoda Mariko and Itano Tomomi)as Kojima’s graduation single. In another article where Takamina was interviewed by Tokyo Sports about this, Takamina actually pleaded with Tokyo Sports not to write anymore about Kojiharu’s graduation as it’d just force her to postpone her plans. AKB48’s 42nd single will feature exiting member Takahashi Minami as center. Takahashi announced her graduation last year and this is her last single. This appointment comes 10 years after after the group released their indies debut “Sakura no Hanabiratachi” in 2006. Takahashi was moved to tears by fans’ cheers and said “The song is a orthodox idol song! I’m really happy to be handed a idol song at the end. It is not a message from me to fans. I want this song to be something that fans can love and other members can sing even after my graduation. The senbatsu members are Iriyama Anna, Kashiwagi Yuki, Kato Rena, Kizaki Yuria, Kitahara Rie, Kojima Haruna, Sashihara Rino, Shimazaki Haruka, Matsui Jurina, Minegishi Minami, Miyazawa Sae, Miyawaki Sakura, Yamamoto Sayaka, Yokoyama Yui and Watanabe Mayu. Coupling song will be the theme song for NHK’s morning drama “Asa ga Kita” titled “365nichi no Kami Hikouki”. Decided to dedicate more “airtime” for my favourite SKE48 member Matsui Rena since she’s graduating soon. I hope Music Station gives her a special graduation stage next week just like all the former top members. Rena certainly deserves it! I was expecting alot of tear jerking footage of Matsui Rena since this is her last single but this music video was very bright just like the song itself. What i liked are the natural scenes of members surprising Rena with a party as she arrived in Okinawa. No script, no directing. The members each pass a sunflower to Rena and relay their personal messages. From there you can see what a motherly figure Rena has been for the group. One scene which struck me was the backview shot of Jurina crying. I’ve never been much of a Jurina fan but she must be feeling really lonely now that her co-pillar is leaving. This is Matsui Rena’s last solo song “2588 days”, a documentary style music video showing footage from auditions, concerts, sousenkyos. Matsui Rena appeared on Mujack hosted by Takahashi Minami and chatted about private topics. Takamina: Who are the members you’ve dined out with so far(just the 2 of you)? (Takamina is shocked.) Only her? So i’m the 2nd member you’re dining together with? Takamina: Your graduation is a big thing for SKE48. Are you worried? Rena: How do i say it? When i decided to graduate, i believed i had done what i can, so naturally i had to take the next step. Surely, when i pull out, something new will takeover. More than being worried, i’m looking forward to seeing how everyone creates a new SKE48. Takamina: I’m most worried about Jurina. What are your feelings about Jurina? I thought that you were quite troubled in the past since Jurina is childish. She has to lead SKE and when she doesn’t know how to go about doing it you’d have to guide her. What is her presence like to you? Rena: She’s like a sister to me, so i didn’t spoil her. (Takamina: Surprisingly you were rather strict?) Well she’s young and i can just praise her by saying she’s cute. But as we’re also colleagues,during times like @#$@#$ i’d say No, and when i see her feeling weak i’d encourage her. I think i was a rather strict sister. Takamina: Did your relationship change after you announced graduation? Rena: I didn’t change but Jurina will keep cuddling up to me, saying she’s lonely for example. Takamina reads a letter to Rena: What i want to say is – Thank You.Even though Rena is straightforward,principled and concentrates well, i think you’re unable to multi-task. Your body seems weak too, so i was often worried.Also, you’re more of a loner and not accustomed to group activities but for the sake of SKE48, you didn’t choose to graduate immediately. As part of WMatsui, you led SKE48 together with Jurina. Jurina was quite the child in the past, and the person who supported her was Rena.You were like her sister, but now that both of you have grown up, seeing how you discuss the future of SKE48 and sometimes disagree, i think you’re both no longer sisters but friends. Honestly, i’m not able to imagine SKE48 without Rena, but since you’ve decided to graduate now, you must have seen the new SKE48. I’m also graduating myself. There must be lots of things that can’t be started without graduating first. This applies not only to the group, but also yourself. So please move ahead to realise your dreams as an actress. Rena reads a letter to Takamina:To me, AKB48 was my idol. When i first saw your performance “Skirt Hirari” on TV, i never stopped being a fan. Entering SKE48, being selected for AKB48 Senbatsu, standing on the same stage as the people i admired, i never thought this day would come.When i first entered senbatsu “Juunen Sakura”, i couldn’t remember the dance moves but Takamina encouraged me and gave me courage. We were the same age, but you were so mature. In such circumstances, you didn’t complain.I learnt alot, and i think alot of members gained courage the same way. When i talked about graduation the day after sousenkyo this year, you supported me just like the first day you talked to me. We will go on different paths from now on, but you’ll always be my star. I want to go to Takamina san’s live and cheer in a loud voice. This was my dream as a fan in middle school. From now on, please continue to show a cool side to everyone. SKE48 Matsui Rena(24) will be graduating on the 31st August after her last theater show. She has been active as part of WMatsui together with Matsui Jurina(18) since 2008. Even though Nikkan Sports got the scoop on her graduation first, Rena had already called Jurina to tell her the news 1 day before she announced graduation. Q: Rena announced her graduation in June. Rena: I wanted to tell the first generation members first. But, Jurina was sad after the sousenkyo, so it was bad timing to tell her. While i was worrying about it, Nikkan Sports had reported it. Rena: But i had contacted her 1 day before the report came out. Jurina: It was good that you told me, otherwise i’d be mad. Rena: She cried hard over the phone. Jurina: I was practically hyperventilating. Rena: She was more emotional than me. Rena: Oya Masana had asked me when I was planning to graduate. I thought everyone had an inkling about it.Although the day was decided, Masana told everyone my graduation hasn’t been approved yet. Jurina: Soulmate will be good. Rena: Eh? Friends? It’s more like family. Very often, people will ask me “Jurina is very special to you?” but personally, she’s like a sister. Jurina: To me, Rena chan is special. Q: You 2 look very balanced together. Rena: We don’t share the same perspectives. Although we’re facing different directions, we try to be move towards the ideal goal. There are always 2 choices, so that’s good. Jurina: During the early period, i didn’t think that people would call us “JuriRena” or “WMatsui” for long. The fans see us as rivals, so I also thought that we had to become rivals. Q: What would have happened if one of you wasn’t around? Jurina:…..I would have quit immediately. Interviewer: That’s if you didn’t have a compatible partner. Rena: I also think that if it wasn’t Jurina, we wouldn’t be compatible. But as a rival its different. Because it’s impossible to topple her presence, i had to think about how to approach so I can move foward. Q: You will be holding a graduation concert on the 29th and 30th in Aichi Prefecture Toyota Stadium? Rena: What do i want to do? I want to sing Kareha no Station, if the fans and members are happy with it. Jurina: I want to do all the songs with pair dances. Shall we? As expected it is so difficult to find their live performances since they are not famous. The ones i found are all TV-recorded. Anyway, these are the guys who sang the insert song for Mayu’s drama “Tatakau!Shoten Girl”. These guys filmed their own performance so the camera angle is somewhat amateur. Takamina appears at the end and her height is being compared with the SOLIDEMO members who are all above 180cm. Kendo Kobayashi continued by saying there’s a letter from listeners, prompting Takamina to panic and ask “Eh!? Is that mail alright? Did you guys really check it?” As if enjoying her reaction, Kendo Kobayashi spent extra time reading out the letter, which in the end had nothing to do with Kashiwagi Yuki. Finally, when asked what she was getting flustered for, Takamina answered “Eh? I thought it was THAT.” She heaved a sigh of relief. AKB48 Senbatsu Sousenkyo Museum opened to the public on the 2nd June and members Takahashi Minami, Kashiwagi Yuki, Yokoyama Yui, Sashihara Rino and Miyawaki Sakura were present for the ceremony. It is tradition for the museum to be open to public before the elections every year and this year the opening period is from 3 June to 21 June. Inside, you can see election posters, costumes and the portraits of winners from yester years. 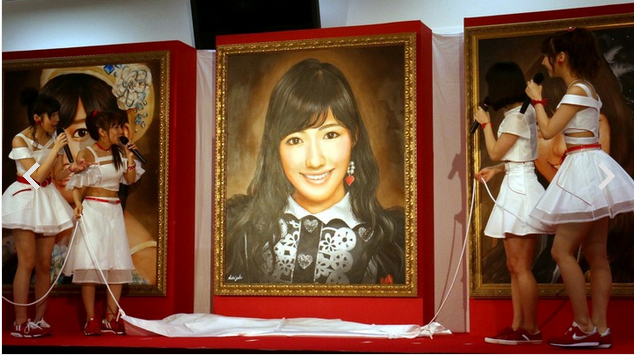 On this day, the portrait of Watanabe Mayu, who won the 2014 General Elections, was unveiled for the first time. During the opening ceremony, the members also wrote down their feelings about the upcoming elections. Yukirin: I want to cry. Yokoyama: I want to make a speech in the best condition. Sakura: Crush the Kami walls. Sasshi: I won’t lose to Yukirin.